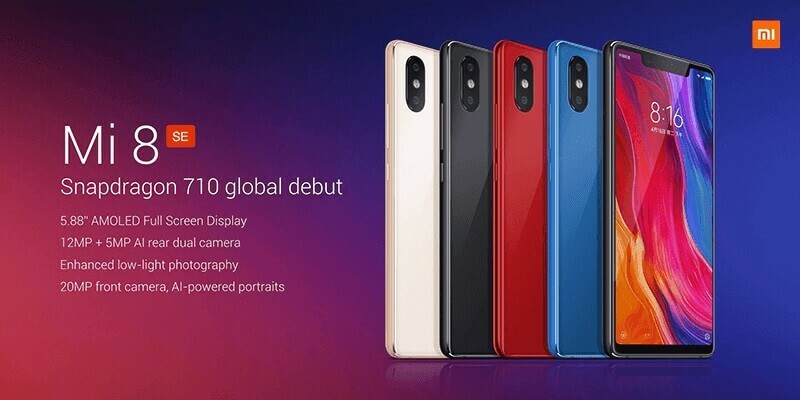 Home News Smartphones Xiaomi Xiaomi Mi 8 SE Unveiled; SD 710, up to 6GB RAM, and 20MP AI Front Snapper! Xiaomi Mi 8 SE Unveiled; SD 710, up to 6GB RAM, and 20MP AI Front Snapper! Xiaomi has launched its flagship smartphones – the Mi 8 and Mi 8 Explorer Edition. And to complete the line, the brand has unveiled its lower-end variant that still offers capable specs – the Mi 8 SE! The Mi 8 SE flaunts a 5.88-inch FHD+ AMOLED panel that gives off 18:9 screen aspect ratio. Under the hood, it packs AI-enabled Snapdragon 710 octa-core chip, paired with Adreno 616 graphics. The device comes with 4GB of RAM or 6GB of RAM, 64GB of internal storage, and 3120mAh battery that supports wireless charging. Moving on to its camera department, it sports dual rear cameras composed of 12-megapixel and 5-megapixel sensors with 4-axis, Dual Pixel PDAF, 2x optical zoom, and portrait mode to enhance your mobile photography. It boasts 20-megapixel selfie snapper with AI technology, as well. For more security options, the device supports both fingerprint scanner and face unlock. It operates MIUI 10 skin based on Android Oreo OS. The Mi 8 SE is priced at CNY 1,799 or roughly Php14.8K (4GB RAM), and CNY 1,999 or around Php16.4K (6GB RAM). Isn’t it powerful? Share your thoughts with us!